Do you watch local and national market trends on a daily basis? Although the Atlanta home inspector is very busy inspecting homes, he does have time to take note of recent market trends from time to time. One tool used to gather information and determine market trends is: The Pending Home Sales Index, which currently indicates a strong housing market. The Pending Home Sales Index is a monthly report which measures the number of homes under contract to sell, but not yet sold, nationwide. According to data from the National Association of REALTORS®, February’s Pending Home Sales Index slipped from the month prior, to 96.5. The index is benchmarked to a value of 100, which was the average of activity for the program’s inception in the year 2001. It also happened to be a year of historically-high levels of home contract activity. 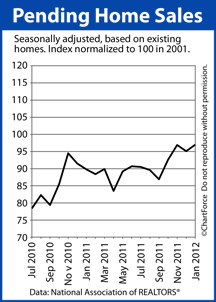 Therefore, a Pending Home Sales Index reading of 100 suggests a strong housing market nationwide. The index has read north of 90 since October 2011. Mild weather may have helped the Midwest Region last month but even regional data can only tell us so much. Like everything in real estate, housing data must be local to be relevant. Throughout the South Region, for example, the area in which contract activity fell most on a monthly basis, there are states which performed better than the regional average, and states which performed worse. Furthermore, even within those states, there are some cities which over-performed, and others which underperformed. It’s why we can’t put too much stock in national housing news. Buyers don’t buy nationally — they buy locally. Today’s home buyers and sellers in Atlanta , therefore, should look beyond the national Pending Home Sales Index and into local market drivers. The Pending Home Sales Index can paint a broad picture of the U.S. housing market but for data that matters to you specifically, it’s not as widely helpful. To get relevant, timely local real estate data, talk to a real estate professional. If you plan to buy an Atlanta foreclosed home, therefore, have a real estate professional on your side. The internet can teach you much about how the GA housing market works, but when it comes to writing contracts, you’ll want an experienced agent on your side. Do us a favor if you or someone you know is about to buy that foreclosure home, please recommend us to them, so that they really know what “As-Is” really is. When you find your foreclosure home, make sure that you get a thorough home inspection in Atlanta, GA from the home inspector Atlanta, GA, David Lelak of IHI Home Inspections, they serve Atlanta and all of North Georgia. Call us today at 404-788-2581 for a thorough home inspection in Atlanta. We won’t let you buy the money pit. You can also schedule your Atlanta home inspection today online. We create Peace of Mind One Atlanta home inspection at a time. Be sure to check out all the other reasons other customers chose IHI Home Inspections at our original website. The Atlanta housing market appears headed for a strong spring season. This exciting news for home sellers in the Atlanta market. Home buyers are still finding great deals, but not sure how long that might last. The data puts pressure on Atlanta home buyers. This is because a “pending home” is a home that’s under contract to sell, but has not yet sold. It’s tracked by the National Association of REALTORS® and, among all housing statistics, it’s the only one that’s “forward-looking”. The Pending Home Sales Index is important to home buyers throughout GA because 80% of homes under contract to sell close within 60 days of contract. In this way, the Pending Home Sales Index forecasts the housing market 1-2 months into the future. Despite contract failures, though, the combination of low mortgage rates and low home prices is enticing to today’s Atlanta home buyers. Expect Atlanta home sales to climb in the coming weeks which will lead to a strong spring season for housing. An “existing home” is one that’s been previously occupied and cannot be categorized as new construction. As Atlanta home inspection providers we see several of both types of homes. Due to the populated areas where we provide home inspections in Atlanta, Ga there is a continuous flow of buyers in “existing home” transactions. Could this be an indicator that a housing recovery is beginning nationwide? According to the National Association of REALTORS®, the January 2012 Existing Home Sales showed a 4 percent increase as compared to December’s revised figures. 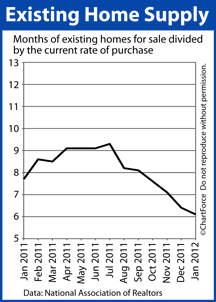 There was also a 20-month high in home resales during this January’s reports. The good news is that demand is high in Canton, Woodstock, Roswell, Kennesaw and other surrounding cities not only for home sales, but for the services needed to complete real estate transactions. This would indicate that Marietta home inspections are on the rise, as well. There is still a positive outlook for those who wish to sell their homes. Since housing stock is at a 5 year low, the demand is higher than the supply, which makes for a higher price on the homes. Higher price on the homes, means more money in the seller’s pockets. Interestingly enough, at the current pace of sales, today’s complete home inventory would “sell out” in 6.1 months. As contract failures subside, Existing Home Sales are expected to rise even faster. Many buyers have tried to buy but could not for reasons such as: appraisals coming in lower than contract pricing, home inspection issues that could not be negotiated, and mortgage denials. First-time buyers continue to power the home resale market. In January, 33% of all sales were made to first-time buyers, up four points from last year. This statistic suggests that renters are moving into homeownership, an important component in a sustained housing market recovery. Given high demand and shrinking supply, we should expect for Bradshaw Farms, Bridgemill, and Harmony on the Lakes home prices to rise in the coming months, if they haven’t already. Thankfully, mortgage rates remain near all-time lows. As a home inspector in Atlanta GA and as a resident as well, we are happy to be seeing a busy market. If you’re looking to buy or sell, right now may be the best time. Looking for a great real estate agent in Atlanta GA to work with, give us a call we know several. We are noticing the housing market finished 2011 with strength, and is carrying measurable momentum into 2012, based on number of home inspections in Atlanta that we alone provided. Seems local real estate experts are busy across the board. According to data from the National Association of REALTORS®, on a seasonally-adjusted, annualized basis, December’s Existing Home Sales climbed by 120,00 units overall from the month prior on its way to an 11-month high. An “existing home” is a home that’s been previously occupied; that cannot be considered new construction. After 4.61 million existing homes were sold in December, there are now just 2.38 million homes for sale nationwide. The last time the national home supply was this sparse was March 2005. At today’s sales pace, the complete, national home inventory would be exhausted in 6.2 months — the fastest pace since before the recession. A 6.0-month supply is believed to represent a market in balance. Clearly, “distressed homes” remain a large part of the U.S. housing market. Furthermore, in its report, the real estate trade group also noted that one-third of homes under contract to sell nationwide succumbed to contract failure last month. That’s up from 9% one year ago. Contract failure occurs for a multitude of reasons, most notably homes appraising for less than the purchase price; the buyer’s failure to achieve a mortgage approval; and, insurmountable home inspection issues. December’s high failure rate underscores the importance of getting pre-approved as a buyer, and of buying homes in “good condition”. For today’s home buyer in Canton , December’s Existing Home Sales figures may be construed as a “buy signal”. Home supplies are dropping and buyer demand is rising. This is the basic recipe for higher home prices ahead. If your 2012 plans call for buying a home, consider that home values throughout GA are expected to rise as the year progresses. The best values of the year may be the ones secured this winter.